Valve wants to know what you’re doing on Wednesday. If your answer is anything other than ‘playing CSGO,’ you might want to reconsider, as signs increasingly point to this being a major update. We’re long overdue for a new operation, and reports that the new Survival mode is impending have only intensified – exactly what this update will contain is unconfirmed, but signs point to it being a big one. The only official thing we have is a tweet from csgo_dev – the official account on Twitter – asking “What are you doing Wednesday?” That’s accompanied by a new profile picture featuring a black silhouetted figure on a red background. The pose and stance are similar to the CS:GO logo that was previously there, but it’s not exactly the same. CS:GO hasn’t seen a new operation since Hydra, and this survival mode has been pending even longer. Another leaked screen noted by Nors3 on Twitter shows the mode being tested, this time with a map called Blacksite. 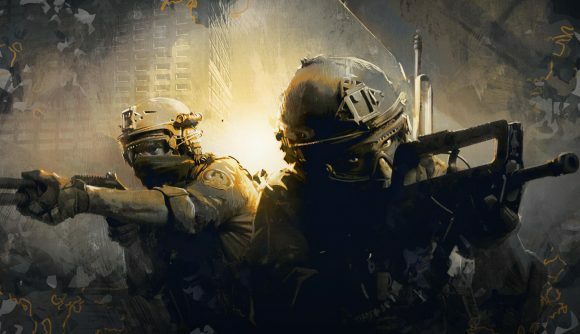 Signs point to this being a sort of CS:GO battle royale, though likely one with a much smaller player count than the 100-person battles currently associated with the genre. We’ll be waiting for December 5 to get the details. Keep an eye on our CS:GO update tracker for details on the latest changes as we head toward the launch of survival and operation 9 – or to prepare for disappointment if this all turns out to be for naught.